Maria Sharapova lost in the first round at Wimbledon after fellow Russian Vitalia Diatchenko came from a set and a break down to oust the former champion. Sharapova served for the match at 5-3 in the second set and was up a break in the third set as well. But Diatchenko refused to give in and won 6-7 (3), 7-6 (3), 6-4. It is the first time Diatchenko has been past the first round at Wimbledon. Jack Sock, the American man seeded 18th, took a tumble to the turf at Wimbledon and then continued his recent downward spiral, wasting a two-set lead and losing to 81st-ranked Matteo Berrettini of Italy 6-7 (5), 6-7 (3), 6-4, 7-5, 6-2. Sock now has lost four consecutive first-round Grand Slam matches and five of his last six. He’s also lost six matches in a row overall, dropping to 5-13 this season. Sock reached a career-high No. 8 in the rankings in November and qualified for the season-ending 2017 ATP finals. Maria Sharapova has been taken to a third set in her first-round match at Wimbledon. The 2004 champion served for the match at 7-6 (3), 5-3 against fellow Russian Vitalia Diatchenko but was broken and then lost a tiebreaker to level the match. Diatchenko has never been past the first round at Wimbledon. Novak Djokovic has equaled John McEnroe’s number of matches won at Wimbledon by beating American Tennys Sandgren in straight sets. Djokovic won 6-3, 6-1, 6-2 on No. 1 Court for his 59th match victory at the All England Club. That puts him level with McEnroe in fifth place on the all-time list, behind only Roger Federer, Jimmy Connors, Boris Becker and Pete Sampras. Djokovic is looking for his fourth Wimbledon title, while Sandgren – who reached the Australian Open quarterfinals – was making his debut in the tournament. American Frances Tiafoe saved 13 of the 15 break points he faced to upset 30th-seeded Fernando Verdasco in the first round of Wimbledon. The 20-year-old Tiafoe relied on a strong serve to win 7-6 (6), 7-6 (5), 3-6, 6-3 over the Spanish veteran and reach the second round for the second straight year. Tiafoe only had four break points himself but converted two of them as he repeatedly got the better of Verdasco on the big points. ”I played to win when it was time to step up,” Tiafoe said. Top-ranked Simona Halep eased into the second round of Wimbledon with a 6-2, 6-4 win over Kurumi Nara of Japan. The French Open champion was playing her first match since winning her first Grand Slam title at Roland Garros but showed no signs of rust as she broke Nara four times to wrap up the win in 78 minutes. Halep made the semifinals at the All England Club in 2014 but lost in the quarterfinals the past two years. Dominic Thiem became the third top-10 player to exit the men’s draw in the opening round at Wimbledon when he retired hurt with his opponent, Marcos Baghdatis, leading 6-4, 7-5, 2-0. The French Open runner-up received a medical timeout for treatment on his back, before the pain eventually became too much early in the third set. Reaching the final at Roland Garros was a career-best Grand Slam result for the 24-year-old Austrian, but the grind of the clay-court season appeared to have taken its toll. Sixth-seeded Grigor Dimitrov lost to Stan Wawrinka on Monday, while 10th-seeded David Goffin lost in straight sets to Australian Matthew Ebden earlier Tuesday. Baghdatis is into the second round for the ninth time in his career and will next face Spain’s David Ferrer or Russian Karen Khachanov. Two-time Wimbledon champion Petra Kvitova has been stunned in the first round by 50th-ranked Aliaksandra Sasnovich of Belarus 6-4, 4-6, 6-0. Kvitova was seeded eighth and among the leading favorites at the All England Club. She was coming off a grass-court title at Birmingham, England, last month and entered Tuesday with a tour-leading 38 victories this season. Sasnovich came in with a 2-3 career record at Wimbledon, including a first-round loss a year ago, and a 9-13 Grand Slam mark. Matthew Ebden upset 10th-seeded David Goffin of Belgium 6-4, 6-3, 6-4 in the first round of Wimbledon. The 51st-ranked Ebden had lost all three of his previous meetings with Goffin but only needed 1 hour, 33 minutes to earn his first win over a top-10 ranked player at a Grand Slam. The Australian has never been past the second round at a major. Two-time champion Rafael Nadal moved into the second round of Wimbledon with a 6-3, 6-3, 6-2 win over Dudi Sela of Israel. The second-seeded Nadal hadn’t played a match since claiming his 11th French Open title last month, but showed little sign of rust as he cruised to victory against Sela. Nadal is seeking a first Wimbledon title since 2010, which would also make him just the second man to do the French Open-Wimbledon double three times. He will next face Vasek Popisil of Canada or Mikhail Kukushkin of Kazakhstan. Nick Kyrgios has served his way into the second round at Wimbledon. The 15th-seeded Australian hit 42 aces and saved all five break points he faced to beat Denis Istomin of Uzbekistan 7-6 (3), 7-6 (4), 6-7 (5), 6-3. Kyrgios earned the only break of the match to go 5-3 up in the fourth set before serving out the match. Kyrgios reached the quarterfinals on his Wimbledon debut in 2014 but had to retire with a hip injury in the first round last year. Fourth-seeded Alexander Zverev of Germany also advanced, beating James Duckworth of Australia 7-5, 6-2, 6-0. Angelique Kerber won a first-round meeting of former Wimbledon runner-ups, beating Vera Zvonareva 7-5, 6-3. Kerber lost the 2016 final to Serena Williams – who also beat Zvonareva in the 2010 title match – and reached the second round for the seventh straight year. Zvonareva was playing in her first Grand Slam tournament in three years after a hiatus to get married and have a child. She came through three rounds of qualifying to make the main draw at the All England Club. Kei Nishikori is into the second round at Wimbledon after beating American qualifier Christian Harrison 6-2, 4-6, 7-6 (3), 6-2. The 24th-seeded Nishikori saw off Harrison’s attempt at a comeback by claiming a tight third set, before cruising to victory in the fourth. Nishikori, the top-ranked Japanese player at the tournament, will next face another Australian, Bernard Tomic, who made the first-round draw as a lucky loser and took full advantage by defeating Hubert Hurkacz of Poland 6-4, 6-2, 7-6 (2). Wimbledon title-holder Garbine Mugurza advanced to the second round with a 6-2, 7-5 victory over British wild card Naomi Broady. The No. 3-seeded Spaniard overcame a partisan crowd as she fulfilled the reigning women’s champion’s honor of opening proceedings on Centre Court. Muguruza faced only one break point in the match, but her failure to convert the regular chances she created on Broady’s delivery made for a competitive second set. However, the two-time Grand Slam champion maintained her focus to close out the match and set up a second-round meeting with Alison Van Uytvanck of Belgium or Polona Hercog of Slovenia. The 10th-seeded pair of CoCo Vandeweghe of the U.S. and Ashleigh Barty of Australia has pulled out of women’s doubles at Wimbledon, a day after the American injured her right ankle in a singles loss. Vandeweghe is a two-time Grand Slam semifinalist and two-time Wimbledon quarterfinalist in singles, where she was seeded 16th. She got hurt during a fall in the first-set tiebreaker of her 6-7 (3), 6-3, 8-6 loss to Katerina Siniakova on Day 1 at the All England Club. Georgina Garcia Perez of Spain and Fanny Stollar of Hungary get into the doubles field after losing in qualifying. Also withdrawing from women’s doubles were Zarina Diyas of Kazakhstan and Zheng Saisai of China. Diyas injured her left knee. They’re being replaced by ”lucky losers” Anna Blinkova of Russia and Marketa Vondrousova of the Czech Republic. Although a drop of rain has yet to fall at this Wimbledon, a timely reminder of the All England Club’s development plans could be provided on Wednesday. Possible showers are forecast for the third day of the tournament, meaning all eyes will be focused on Centre Court, where its retractable roof will allow play to continue. In a year, attention will be split between two courts under such circumstances, with a retractable roof on No. 1 Court scheduled to be completed in time for the 2019 tournament. A total of 2.2 million man hours have been spent working on the project since it began in 2016, with an average of 750 people participating on each working day. The roof is set to be given its first test next May 19, with an exhibition of tennis for charity. Juan Martin del Potro maintained his record of never losing in the first round at Wimbledon. The fifth-seeded Argentine beat Peter Gojowczyk of Germany 6-3, 6-4, 6-3 on Tuesday to set up a second-round meeting with Feliciano Lopez. It was del Potro’s first grass-court match of the season after withdrawing from Queen’s with a groin injury, but the former U.S. Open champion used his big serve to dominate the match – hitting 22 aces and saving all four break points he faced. Del Potro has reached at least the second round in all nine of his Wimbledon appearances and reached the semifinals in 2013. Lopez beat Federico Delbonis of Argentina 6-3, 6-4, 6-2. Last year’s semifinalist, Johanna Konta, is through to the second round after beating Natalia Vikhlyantseva of Russia 7-5, 7-6 (7). A year ago, Konta became the first British woman to reach the last four since 1978, before losing to Venus Williams. After struggling through the first half of 2018, Konta has begun to show signs of the form that helped her reach a career-high No. 4 ranking following last year’s Wimbledon. 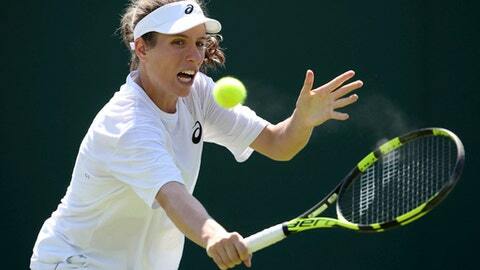 The 22nd-seeded Konta saved two set points at 4-5 in the second against Vikhlyantseva before closing out the match to set up a second-round meeting with Dominika Cibulkova of Slovakia. Australian trio Daria Gavrilova, Ashleigh Barty, and Samantha Stosur all advanced to the second round at Wimbledon with straightforward wins. The 26th-seeded Gavrilova cruised past U.S. lucky loser Caroline Dolehide 6-2, 6-3. She will face Stosur in the next round, after the 2011 U.S. Open champion defeated Shuai Peng of China 6-4, 7-5. Meanwhile, the 17th-seeded Barty defeated Swiss opponent Stefanie Voegele 7-5, 6-3 to claim her first main-draw singles victory at the All England Club. Barty will next face British wild card Gabriella Taylor or 2014 runner-up Eugenie Bouchard. As he began his Wimbledon campaign early on Day 2, Feliciano Lopez made history just by taking to the court. The 36-year-old Spaniard broke Roger Federer’s record by appearing in a 66th consecutive Grand Slam singles tournament, continuing a run that started at the 2002 French Open. Lopez, who has reached the Wimbledon quarterfinals on three occasions, took the first set 6-3 against Federico Delbonis of Argentina on Court 7. The winner faces a potential second-round meeting with fifth-seeded Juan Martin del Potro, who is also a set up, against Peter Gojowczyk on No. 3 Court. Play is under way on Day 2 at Wimbledon. Last year’s semifinalist, Johanna Konta, is the early center of attention as the home player attempts to put a disappointing first half of the year behind her in an opening-round matchup with Natalia Vikhlyantseva of Russia on No. 2 Court. Juan Martin del Potro, a 2013 semifinalist, has also begun his campaign on No. 3 Court. The fifth-seeded Argentine faces Peter Gojowczyk of Germany. Defending champion Garbine Muguruza will open play on Centre Court at 1 p.m. when she takes on British wild card Naomi Broady. Garbine Muguruza will begin the defense of her Wimbledon title in perfect conditions on the second day of play at the All England Club. There will be added intrigue as the No. 3-seeded Spaniard opens proceedings on Centre Court against British wild card Naomi Broady. Muguruza defeated Venus Williams in the 2017 final to claim her first Wimbledon crown. Also in action is top-seeded Simona Halep, who is looking to build on winning her maiden Grand Slam title in Paris last month as she faces Kurumi Nara of Japan. The Roland Garros men’s winner is also playing: Two-time champion Rafael Nadal begins his quest for a first Wimbledon title since 2010 against Dudi Sela of Israel. Three-time winner Novak Djokovic faces U.S. player Tennys Sandgren on No. 1 Court as the Serb looks for his first title anywhere in more than a year. With the sun out in London, there’s little chance of a rain delay, with the forecast predicting temperatures of up 81 degrees (27 C).